Bali 9 inmates Andrew Chan and Myuran Sukumaran are closer to execution. They could be killed within weeks. Andrew Chan's appeal for clemency was denied last week. (Background here.) A police commander says he has received messages the two are on a list for February. 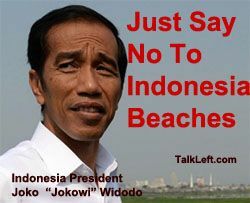 Indonesia President President Joko “Jokowi” Widodo and the country's Attorney General say no more appeals are allowed by law. Their lawyers disagree, and have filed a new appeal in the Densepar District Court. Today, according to their lawyers, the court accepted the new appeal for filing. Indonesia has a new president, Joko Widodo. In December, he pledged to get tough on the drug traffickers sentenced to death, including the foreign prisoners who have languished for years in Bali's hellhole Kerobokan prison. The inmates will be taken to the prison at Nusa Kambangan, an island off the coast of Java, where they will be executed by a 10-person firing squad from the Central Java Police’s Mobile Brigade Unit (Brimob). Basically, they are tied to a wooden cross and shot. 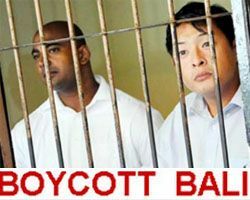 The 'Bali Nine' are learning their fate in Bali this week. Two have been sentenced to death. The rest, who were mules, were sentenced to life imprisonment. Renee Lawrence cooperated with authorites and prosecutors asked for her to receive a 20 year sentence. The judges sentenced her to life as well. 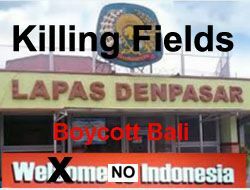 Boycott Bali. A country that sentences teens with no prior record to life in prison and young adults to death is a country with an inhumane system of justice that does not deserve to have tourists -- or your dollars.